There are 7 Assisted Living Facilities in the Hilton Head Island area, with 4 in Hilton Head Island and 3 nearby. The average cost of assisted living in Hilton Head Island is $3,106 per month. This is lower than the national median of $3,346. Cheaper nearby regions include Bluffton with an average starting cost of $2,900. To help you with your search, browse the 42 reviews below for assisted living facilities in Hilton Head Island. On average, consumers rate assisted living in Hilton Head Island 4.1 out of 5 stars. Better rated regions include Hilton Head with an average rating of 4.4 out of 5 stars. Caring.com has helped thousands of families find high-quality senior care. To speak with one of our Family Advisors about assisted living options and costs in Hilton Head Island, call (855) 863-8283. A barrier island that attracts many visitors with its resort-like atmosphere, Hilton Head Island is more than simply a vacation destination. The island features a sizable senior demographic, with more than 30 percent of residents 65 and older. Hilton Head Island is home to four assisted living facilities with a further five located nearby. The South Carolina Department of Health and Environmental Control licenses the state’s assisted living facilities. These facilities, also known as community residential care facilities, are designed to provide seniors with a home-like setting complemented by assistance with activities of daily living like bathing and dressing. Assisted living facilities also provide nutritious meals and medication supervision. Hilton Head Island has an array of resources for seniors, including the Hilton Head Island Senior Center, which offers fitness classes, arts and crafts, health screenings, educational programs and seminars, golf outings, bridge and other games, trips and social gatherings. Hilton Head Island is home to world-class medical facilities, including Hilton Head Regional Healthcare, in the event of medical emergencies and illness. There are multiple cultural attractions on and near Hilton Head Island such as the Arts Center of Coastal Carolina, Audubon Newhall Preserve, Jazz Corner and the Gullah Museum. Seniors living on fixed incomes may be concerned that the cost of living index on Hilton Head Island of 136 is substantially above the national average, which is 100. Seniors who are concerned about community safety may take comfort in Hilton Head Island’s crime rate, which is below the national average. The island has an average crime rate of 1,618 crimes per 100,000 people, while the national average is 2,827 crimes per 100,000 people. As a barrier island, Hilton Head Island is sometimes in the path of sea storms, including hurricanes. This type of inclement weather may concern some seniors. However, its warm summers that feature average temperatures of 88 degrees Fahrenheit are often relieved by sea breezes. Winters tend to be mild with an average January low of 37 degrees Fahrenheit. Assisted Living costs in Hilton Head Island start around $3,106 per month on average, while the nationwide average cost of assisted living is $4,000 per month, according to the latest figures from Genworth’s Cost of Care Survey. It’s important to note that assisted living rates in Hilton Head Island and the surrounding suburbs can vary widely based on factors such as location, the level of care needed, apartment size and the types of amenities offered at each community. 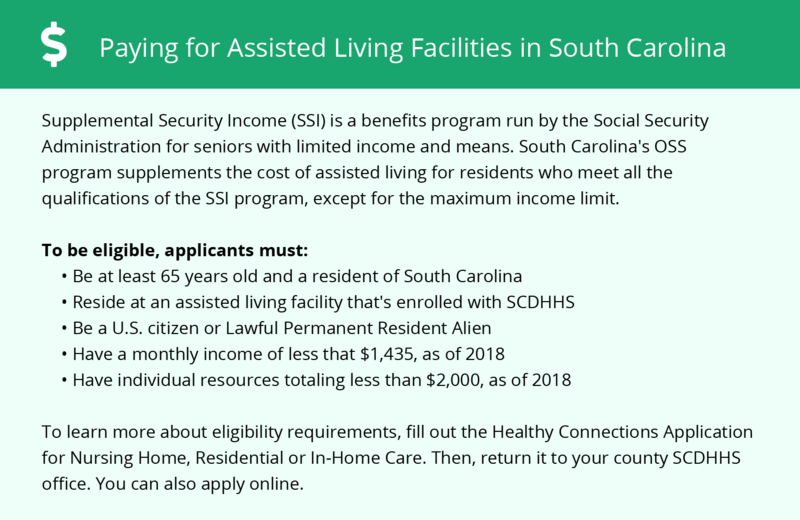 South Carolina does not offer financial assistance to seniors in order to pay for assisted living facility care. Its current public assistance waivers only provide assistance for seniors who require support in their homes or for seniors who require nursing home-level care. 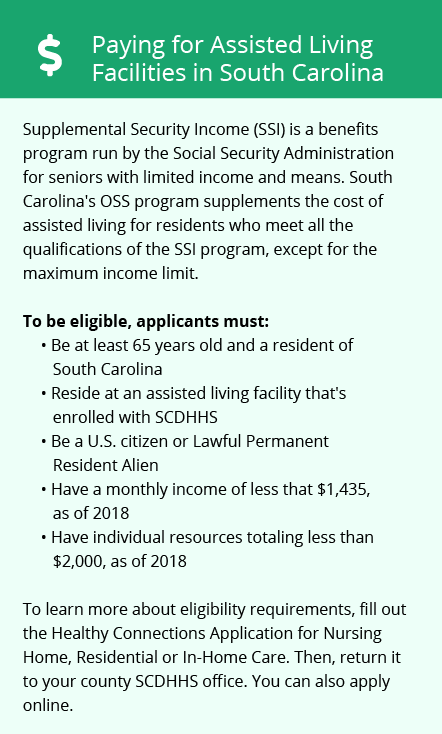 Even so, seniors who are receiving SSI benefits may qualify for the state to pay a supplement for care at an assisted living facility. Hilton Head Island and the surrounding area are home to numerous government agencies and non-profit organizations offering help for seniors searching for or currently residing in an assisted living community. These organizations can also provide assistance in a number of other eldercare services such as geriatric care management, elder law advice, estate planning, finding home care and health and wellness programs. To see a list of free assisted living resources in Hilton Head Island, please visit our Assisted Living in South Carolina page. Hilton Head Island-area assisted living communities must adhere to the comprehensive set of state laws and regulations that all assisted living communities in South Carolina are required to follow. Visit our Assisted Living in South Carolina page for more information about these laws.